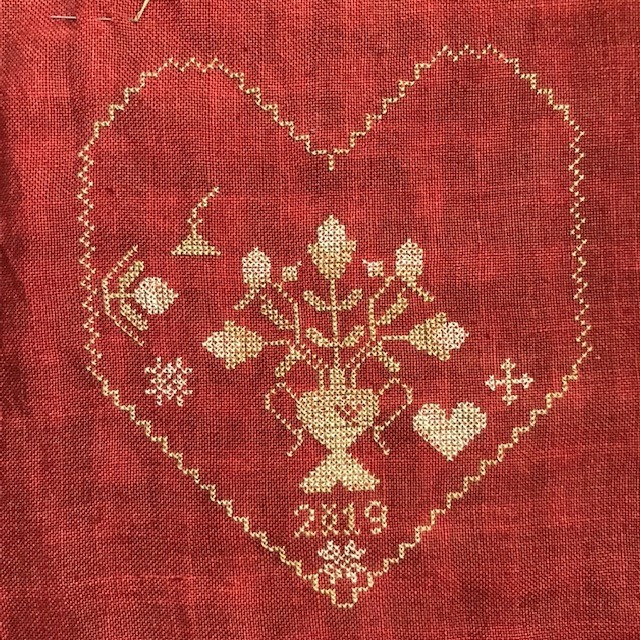 This Stitch from my Stash project was a market kit by Stacy Nash for the Nashville 2018 market. I posted progress pics on Instagram. and finished the stitching fairly quickly. I am just tickled with the fully finished pin disk! As you can see, I did tweak the hand a bit to my liking. 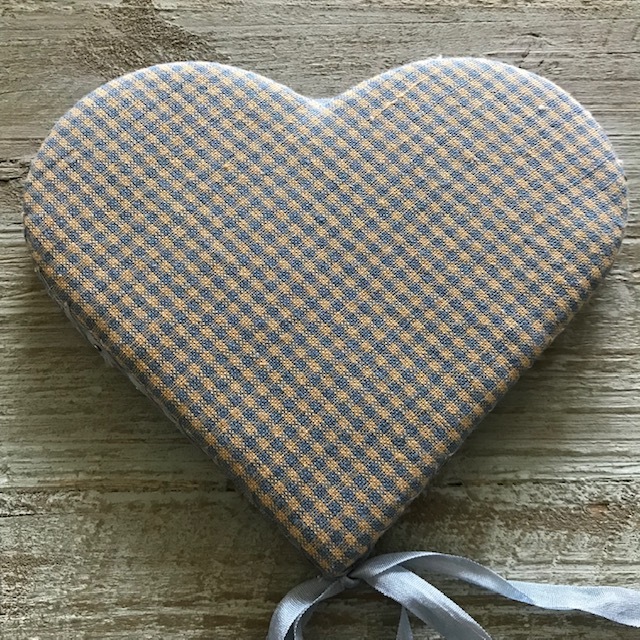 I decided to make the stitched heart checkered so as to eliminate the outline backstitch. And I changed the basket to a softer black. I am so pleased that I think I will leave it out past February to enjoy it a bit longer. I like the backing fabric included in the kit. Here you can see the side detail of ribbon, stitched X's, and pins. I stitched a bit on this while in the hospital. I was so thrilled when the border worked out and met where it should! 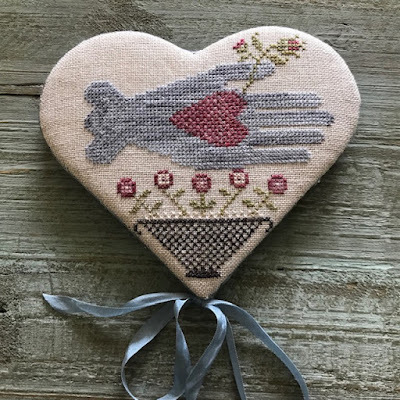 I shared this Wooly Heart unfinished class project by Rebekah L. Smith. I was so glad I picked a smaller project after my large "Snowy Days" from last month. The wool forms a little wooly pocket to add flowers, valentines, etc. 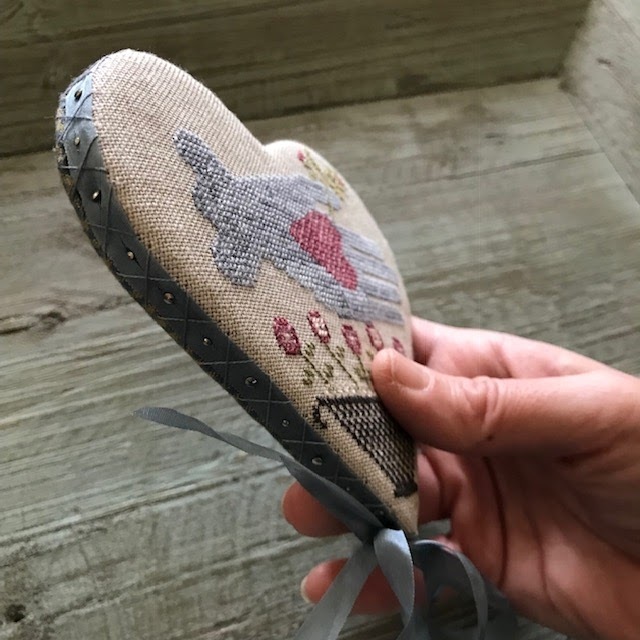 The beautiful comb painted heart is by Peter & Lori Brechlin of Notforgotten Farm. It was a fun quick stitch and I am not sure why I hadn't finished it sooner. and enjoyed the specialty stitches. you know that I was hospitalized unexpectedly for three days this past weekend. I was diagnosed with shingles on Friday. The shingles are on my face and scalp. They were moving towards my eye and two friends in the healthcare field suggested I go to the ER. Once there, they realized that I am on immune suppressants and admitted me for IV antivirals. Thanks so much for all of your well wishes! They mean so much! and pleased that truth will win. and never will she fall. Years ago when I was knitting, I started this tote bag. My knitting friends taught me how to knit on circular needles on a trip to Galena. It's a lot of knitting! I knitted about a quarter of it, then packed it away. A while back, I gave 95% of my knitting supplies to my sister ~ the knitter extraordinaire! Here is her family's new cat, Jack, modeling the knitted tote - it is more true to color here. My sister gifted me with the felted tote for Valentine's Day! Am I lucky or what?!?! My intention was never to have her give me the finished product ~ truly! Don't you love how fuzzy it is? Thank you ever so much Sis! I just had to share my new favorite project bags! You can find them on Nikki's Notables Etsy Shop - just click here. Aren't the details wonderful - including this sweet removable zipper pull? I love the clear vinyl window - you know exactly what project is in it before opening it. I loved it so much, that I ordered a second bag pretty quickly! This is the small size and fits perfectly in my purse. It is made of a soft and cozy flannel that was perfect all winter long. Nikki recently came out with a new size that fits 8.5 by 5.5 size patterns perfectly. Yep, I had to order another bag - especially when I saw the fabrics! and the knitted sweater zipper pull. and Nikki has a new matching notions bag too! This is perfect for my wool applique - a few spools of thread, small ruler, scissors, pins and needles and I am all set to go! For I am convinced that neither death, nor life, nor angels, nor rulers, nor things present, nor things to come, nor powers, nor anything above, nor anything below, nor anything else in all creation can separate us from the love of God that is ours in union with the Messiah Jesus, our Lord. 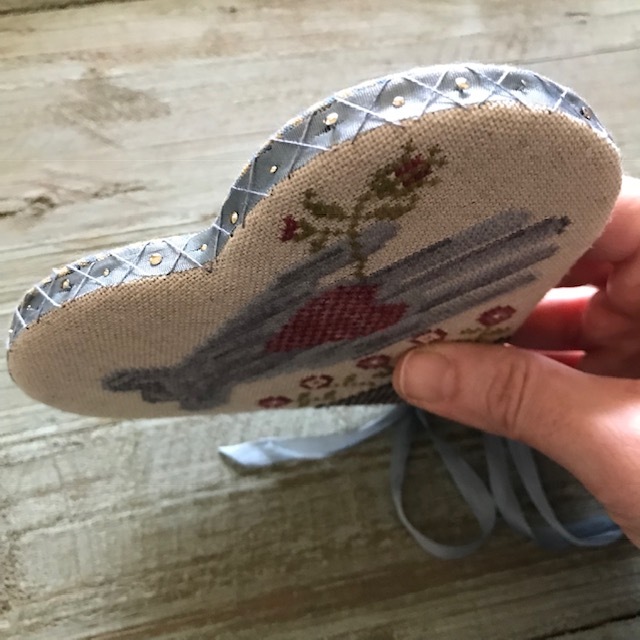 I started this project two years ago and thought it was perfect for my February Stitch from My Stash challenge. The chenille trim is "Watermelon Juice" from Dames of the Needle and it matches the floss used ~ "Jakey Brown" by Classic Colorworks perfectly! I love the backing fabric that I found in my stash as well. Last night I went to dinner with Mom and my sister to celebrate Valentines Day. 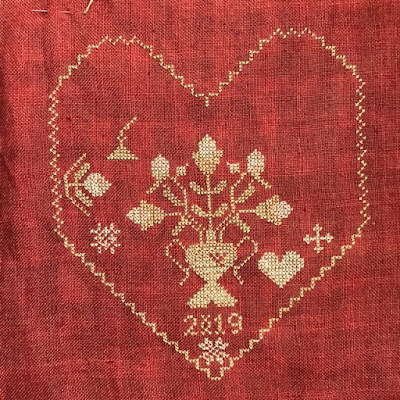 Rebekah L. Smith's "Stitching Smalls Cozy Hearts"
The back is as sweet as the front. My sister also gave me a gift, but I will save that for its own post. Wishing you each a Happy Valentines Day! This was my bonus project for finishing all of my Stitch from My Stash projects from January. I've had this old vintage granite ware container with lid for some time. I added some green textured flannel for a little edge behind the stitched piece and applied it with magnets. I also added the matching Needle Nanny to the front and some JABC pins to the top. switch them out each season. It makes a sweet little sewing box. On to the February projects! and I will honor your name continuously. you’ve delivered me from the depths of Sheol. between the short days and lack of sunlight. I love all the different background wools. I'll be putting it away for next winter - but it will be a nice surprise to pull it out all finished then. I love the brushed flannel that I chose for the the backing and the brushed cotton binding with a subtle stripe. And here is Mom's version that I shared last year. She finished hers in about a month rather than 6 years lol! Leia had to bring her toy Lambchop over right away to see my finish. let me wholeheartedly revere your name. My February Stitch from my Stash projects are ready to go! I kitted and started this Blackbird Designs project several years ago, but then it was lost in the shuffle. This kit was a Nashville exclusive release by Stacy Nash last year. Let's see if I can get it done before all the great Nashville releases this year. also by Blackbird Designs in their book "My Dear Hearts"
I had kitted this up at The Attic on a trip to Mesa, Arizona for Cubs spring training two years ago. I better start stitching fast! 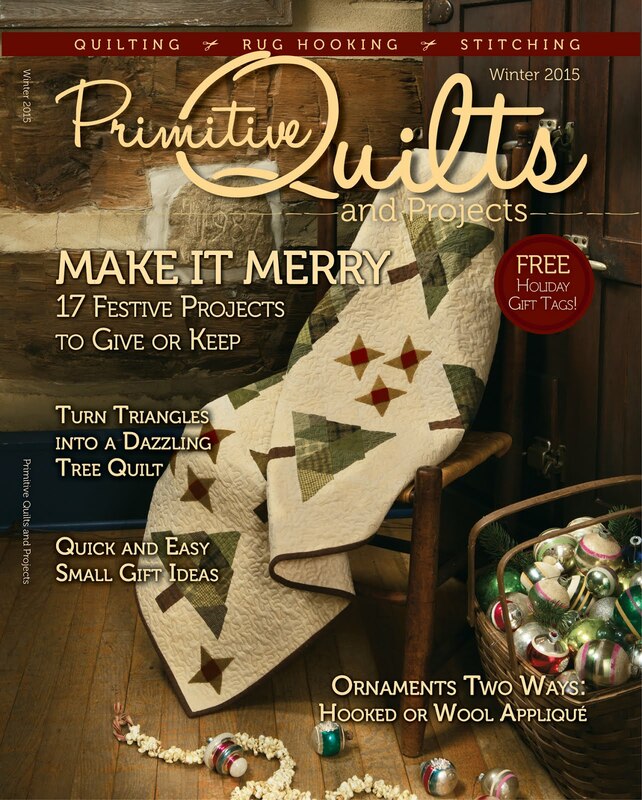 I did pick one wool applique kit from my stash. This was a class by Rebekah L. Smith for the From Our Hands Retreat last spring. (Don't worry, I have another project on tap in case I have extra time lol! 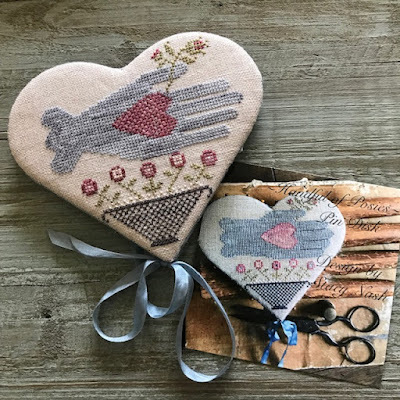 Not from my stash, but a new project - "Cozy Heart Coasters"
from Rebekah L. Smith's Stitching Smalls. Wish me luck on having lots of finishes in this short month of February! All the nations that you have established will come and worship you, my Lord. They will honor your name.